Millions of wild buffalo once roamed the American West. From Mexico to Canada, bison populated the continent long before people settled there. Scientists believe that bison came to North America via a land bridge from Asia. As herbivores, the bison adapted to the Eastern woodlands and Great Plains, receiving nourishment from the rich grasses. In the United States, "bison" and "buffalo" are often used interchangeably, although bison is the most accurate term, as "buffalo" technically refers to species from Africa and Asia, such as the cape and water buffaloes. Weighing up to 2,400 pounds and standing about six feet tall at the shoulder, bison appear ungainly, yet are surprisingly fleet. In fact, bison can move up to 35 miles an hour, rushing in to defend their young or when approached too closely by people. Their broad shoulders allow them to plow through deep snow, and their shaggy heads are made for pushing snow aside to reach the vegetation below. 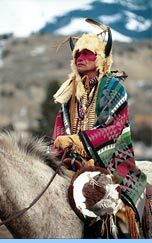 The history of the buffalo is entwined with the plight of the Native Americans in the American West. Indian tribes settled these same grasslands centuries later because of the plenteous bison. Native peoples came to rely on the bison for everything from food and clothing to shelter and religious worship. They used almost every part of the animal, including horns, meat and tail hairs. By the 1800s, Native Americans learned to use horses to chase bison, dramatically expanding their hunting range. But then white trappers and traders introduced guns in the West, killing millions more buffalo for their hides. By the middle of the 19th century, even train passengers were shooting bison for sport. "Buffalo" Bill Cody, who was hired to kill bison, slaughtered more than 4,000 bison in two years. Bison were a centerpiece of his Wild West Show, which was very successful both in the United States and in Europe, distilling the excitement of the West to those who had little contact with it. To make matters worse for wild buffalo, some U.S. government officials actively destroyed bison to defeat their Native American enemies who resisted the takeover of their lands by white settlers. American military commanders ordered troops to kill buffalo to deny Native Americans an important source of food. In 1905, zoologist William Hornaday formed the American Bison Society to re-create more wild herds. President Theodore Roosevelt persuaded Congress to establish a number of wildlife preserves, and, with the help of a cadre of private bison owners, the Society was able to stock a number of preserves and parks. 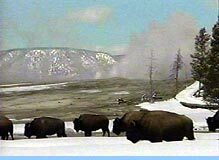 This organization supplemented the existing herd of about 20 bison that lived in the newly formed Yellowstone National Park. Until 1967, bison numbers were controlled by the park and their population limited to 397. After that year, the National Park Service adopted a new policy of minimal management, and no killing or disease control was done. The population increased, peaking in the 1990s at more than 4,000. Today, the Yellowstone herd stands at over 3,000 animals. It is thought by many to be the United States' last free roaming bison herd. Currently there are between 150,000 and 200,000 bison throughout North America, although the vast majority of them are raised on ranches for commercial purposes (mostly for meat, hides and skulls).